Dairy farming continues to be one of St. Lawrence County’s largest economic drivers, but small-scale family operations, as a main income source, are disappearing. 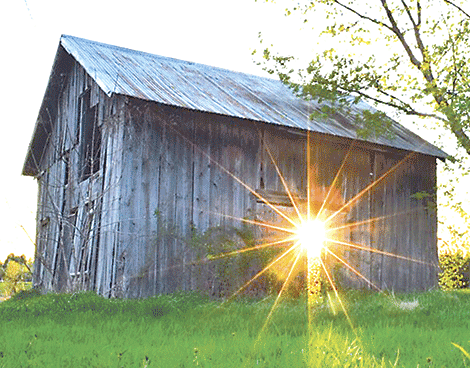 Towns like Madrid, Lisbon, and Canton still boast many dairy farms, but littered between them are decrepit barns that serve as a reminder of the changing times. Farming in St. Lawrence County has undergone massive change in the past 15 years with the number of dairy farms declining by 20 percent from 2002 to 2017. In 2002, St. Lawrence County had 407 dairy farms, according to a New England Milk Market report provided by St. Lawrence County planners. The same report showed 323 dairy farms were in operation in 2017. Madrid dairy farmer Kevin Acres, who operates a 300-cow farm, says his dairy has tripled since he got into the business in the 1980s. He says milk prices, expensive modern equipment, higher fuel costs and a decline in inter est in the trade have all contributed to the changes. St. Lawrence County is still thriving in terms of milk production, but the scale and feel of farms has changed greatly. Traditional family farms milking fewer than 100 cows are declining, while large-scale dairy operations are growing. A 2012 report from the United States Department of Agriculture shows almost three-quarters of dairy farms across the nation still had fewer than 100 cows, but the larger farms are producing more than 80 percent of the milk. That same report shows the midpoint herd size growing substantially over a 20-year period. In 1992 the midpoint dairy herd size was 101; in 2012 the midpoint was 900. That trend has likely continued to climb, including in St. Lawrence County. Today, some local farms milk more than 2,000 cows. Among them are the Stauffer Farm of North Lawrence, with 3,300; Woodcrest Dairy in Lisbon with 2,750; Mapleview Dairy of Madrid, 2,200; and C & M Dairy, Lisbon, 2,000. In New York in 2002, only about 21 farms statewide had dairy herds of 1,000 or more cows. By 2012 that number had grown to 103, and many of those herds were larger than 2,500 head. In that same period, the number of farms milking between 50 and 99 cows declined from 3,345 to 1,675. Some of the county’s small farms have found success in the organic dairy market, but many have been forced to grow or shutter. The decline, however, has not been smooth and steady. There have been drops and spikes in the number of dairy farms over the 15-year period. 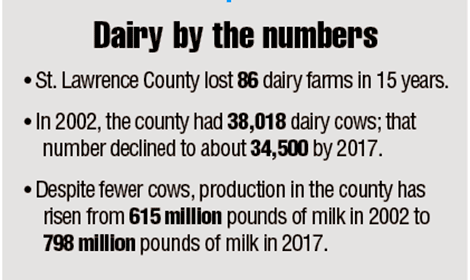 At its lowest point in 2008, St. Lawrence County had only 266 dairy farms, and since then the number of farms grew as high as 340 in 2015 before dropping back to 323 in 2017, the market report shows. It’s difficult to pinpoint the cause of spikes and dips in the number of dairy farms, but small Amish farms likely play a role. While data on St. Lawrence County’s population in 2010 was not readily available, statewide the Amish population has increased from around 5,000 in 2000 to an estimated 19,835 in 2018. Amish tend to rely on agriculture of all kinds, including dairy, to support their families. While the decrease in farms has certainly impacted many family-run operations and altered the lifestyle that spanned generations for many, it has not hurt the county’s milk production. In fact, St. Lawrence County’s 407 farms in 2002 produced 615 million pounds of milk, while the 323 farms in 2017 produced 798 million pounds of milk. Conversely, the rise in milk production in St. Lawrence County does not correlate with an increase in the number of milking cows. A report from St. Lawrence County in 2002 showed 38,018 dairy cows, while the New England Milk Market report showed 34,500 in 2017. Reports from the USDA show that the average dairy cow now produces substantially more milk than in the past. Acres says this is due to more efficient milking systems, more refined and controlled bovine genetics, higher quality food, and better tracking, monitoring and treatment of sickness and other problems that arise. 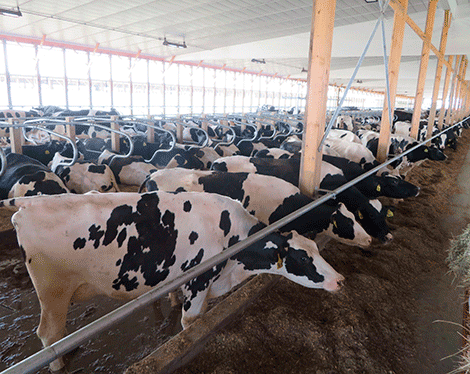 Several factors are likely contributing to the decline of the family dairy farm. Volatile milk prices have long plagued the industry. While the prices do tend to cycle around from year to year, prices have remained fairly low since 2016. Similar periods of low prices have occurred on and off for decades, but milk payments today remain much lower on average than they were in the ’80s and ’90s when factoring in inflation. Acres says larger farms are better suited to ride out low prices due to better profit margins from the economy of scale. The larger farms also tend to have more borrowing power than traditional farms. The big farms find more savings through efficiencies, including more modernized milking parlors, free stalls and more fuel-efficient equipment. Advances in technology have allowed these large-scale farms to cut energy costs and better track expenses in real time, Acres says. While the traditional small family dairy farm as a main source of income is fading away, an interest in agricultural life still exists. A nationwide back-to-the-land movement has many people interested in gardening, and in St. Lawrence County’s more rural areas, chickens, goats and beef cows remain commonplace. St. Lawrence-Lewis County BOCES is hoping to capitalize on this interest in agriculture to grow the area’s next generation of farmers. Next week North Country This Week will take a look at the Agricultural Studies Academy launched by BOCES in September.